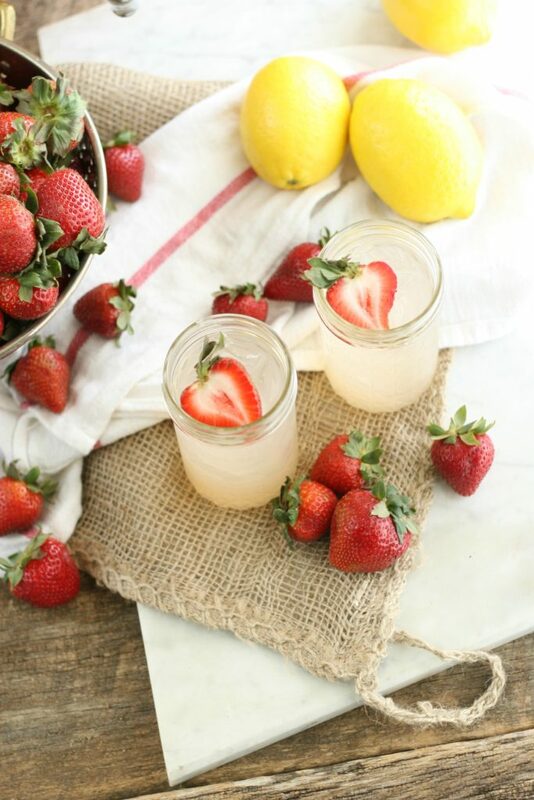 Homemade Strawberry Lemonade is easy to make in your own kitchen using simple ingredients. This refreshing drink is made with ripe strawberries and freshly squeezed lemon juice. Don’t you just love a refreshing glass of lemonade on a hot summer day? Creating yummy flavorful drinks at home is super simple. Spring is here, daffodils are blooming and I’ve got the screen door open with a great Southern breeze blowing through. And before you know it summer will be here! 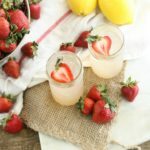 Making Homemade Strawberry Lemonade has never been easier and once you do, you’ll never buy anything store bought again! All you need is a simple hand food mill or fine mesh strainer. Depending on how much pulp you prefer, you can decide if you just want juice from strawberries or a little bit of pulp. It’s all to your personal preference. 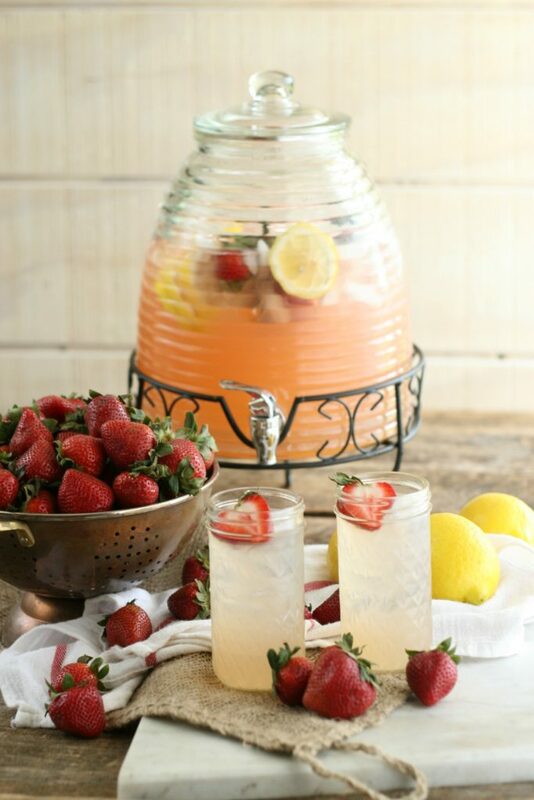 Make this refreshing Strawberry Lemonade with only a few simple ingredients. In a medium saucepan over medium heat cook the strawberries with about 1/4 cup of water. This helps them not to burn. Cook them until they are really soft. Put the softened strawberries through a food mill or fine strainer. Let the strawberry puree cool. Discard the seeds and pulp. Bring the remaining 4 cups of water and sugar to a boil to create a simple syrup. Let cool. Pour into a pouring pitcher. Add the lemon juice and strawberry puree. Add enough ice cubes to fill the pitcher and garnish with additional strawberries before serving. This lemonade sounds so refreshing! Winter is finally over in WA, and I can’t wait to enjoy a glass of this in the sunshine. 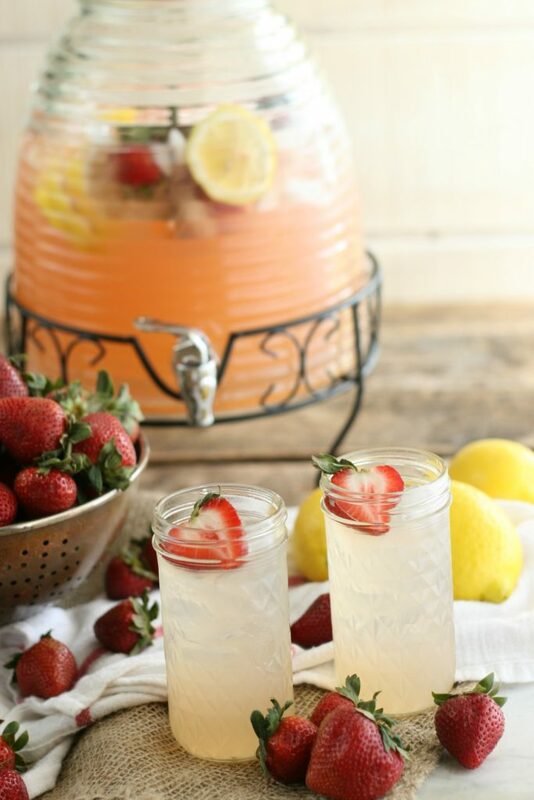 Strawberry lemonade is such a refreshing drink! Great recipe to use next time my kids do a lemonade stand to step it up a notch! This is making me want warmer weather right now! This sounds so refreshing! Now you have me longing for summer. This is a perfect refresher for the screened porch. Love how easy this is to make from scratch. It’s still pretty chilly here in Missouri but this has me wishing it was sunny and 75 out! Sounds so yummy. My kids love strawberry lemonade I usually buy from grocery store. But your recipe is so easy and delicious I will give it a try.